Today, March 10th, we show you Fantail Pigeons in the Water Lily Pools Zone. 3월10일 오늘은 수련못존에 있는 공작비둘기를 찍어보았습니다. Fantail Pigeon is a domesticated variety of Rock Pigeon(Columba livia). 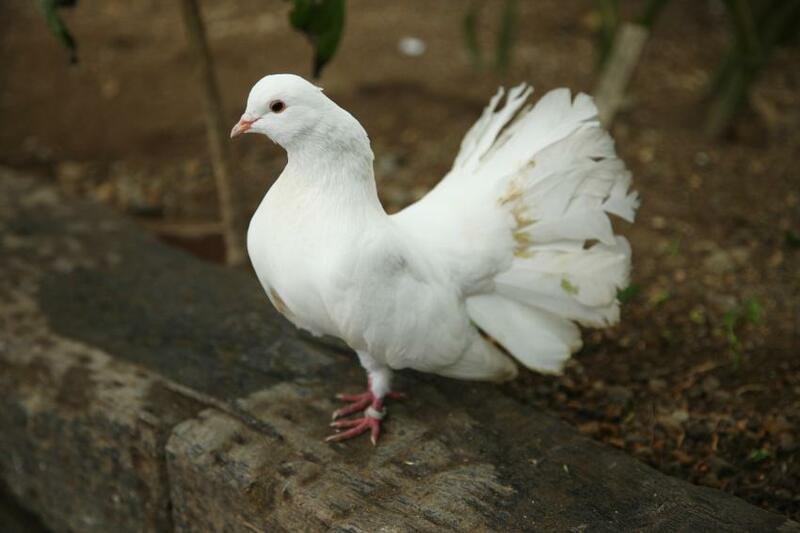 A tail of normal pigeon has about a dozen of feathers, but that of Fantail Pigeon has 20-32 feathers that are spread like a fan, hence it was so named. The Garden keeps about 20 Fantail Pigeons, including young bird hatched out last year. 공작비둘기는 야생비둘기의 개량품종으로서 보통 비둘기의 꼬리는 깃이 12개정도 밖에 안되는데 공작비둘기는 20~32개나 있습니다. 꼬리깃이 부재처럼 펼쳐짐으로 부채비둘기라고도 합니다.당원에서는 지난해 태여난 공작비둘기를 합쳐 20마리쯤 있습니다. The pigeons build numerous nests on Brugmansias on the right just beyond the entrance of the Water Lily Pools Zone. 공작비둘기들은 수련못에 들어서 바로 오른쪽에 있으며 엔젤트럼펫나무아래에 둥지를 만듭니다. Materials of the nests are dead leaves and branches of Brugmansia and fallen feathers. 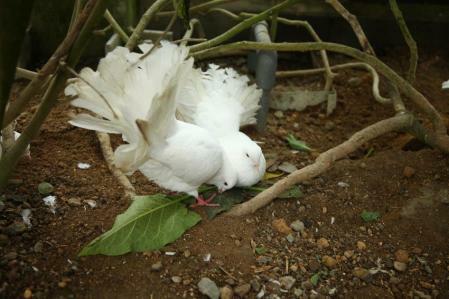 Some pigeons were carrying leaves to build nests while I was taking pictures. 우리는 주로 떨어진 엔젤트럼펫의 잎이나 가지,그리고 뽑혀떨여진 새의 깃입니다.사진을 찍고 있는데 마침 떨어진 잎을 운반하여 집을 짓고 있었습니다. I found a pigeon immobile on a nest. 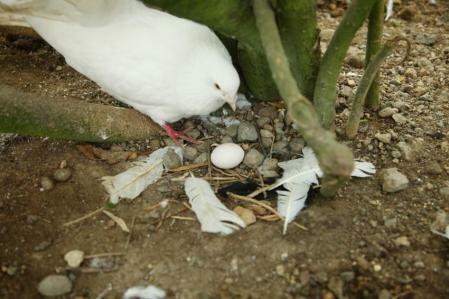 As I removed the pigeon, it turned out to be sitting on eggs. It seems that the pigeons started laying eggs earlier than last year when the first eggs were discovered in June. 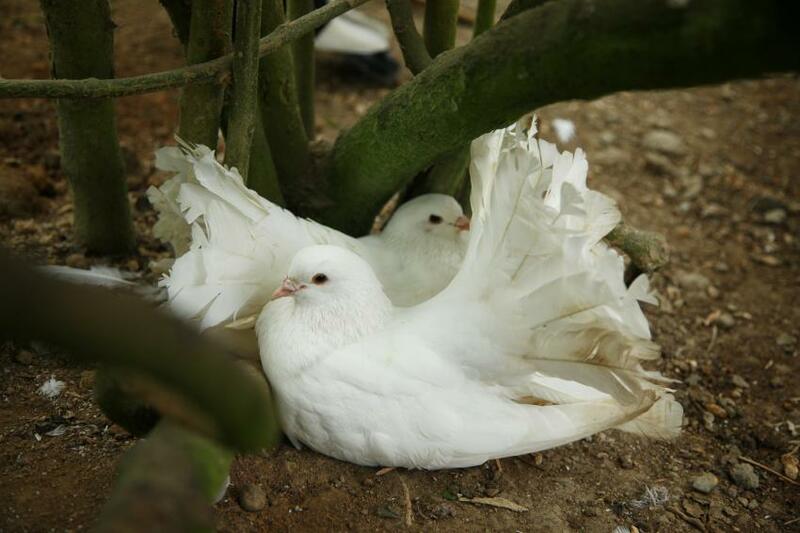 However, since the temperature remains unchanged throughout the year in the Garden, the period may have little to do with breeding behaviour of the pigeons. 둥지위에서 오랫동안 꼼짝않고 앉아있는 비둘기가 있길래 관찰해보았더니 알을 품고 있었던 것이였습니다.6월말부터 번식하기 시작한 작년에 비해 올해는 좀 일찍한것 같습니다.원래부터 원내는 일년내내 따스하여 특히 번식계절이 아니라도 번식하는것일지도 모릅니다. 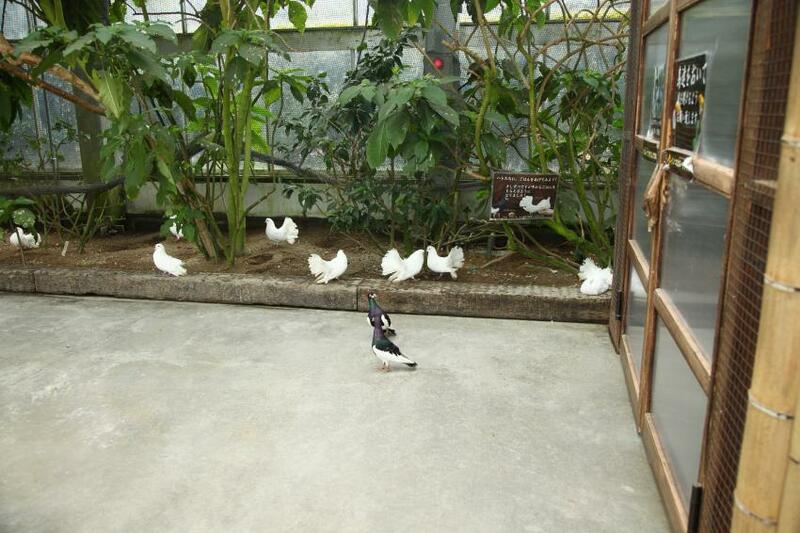 As I retreated after taking pictures, a pair of pigeons returned on the eggs. The eggs may be unfertilized, but of course we hope not. We are looking forward to their successful incubation. 사진을 찍고 뒤로 물러섰더니 수컷과 암컷이 바로 같이 알을 품기 시작했습니다.알은 무정란일 때도 있는데 될수록이면 유정란이였으면 합니다.새로운 아기비둘기가 태여나기를 기대하고 있습니다.